Talk of building a second Transbay Tube must have started the day BART opened the "First" Transbay Tube in 1974. Now with BART's escalating ridership and the construction of the Transbay Transit Center, talk of a second tube under the bay has begun - at least in some circles. 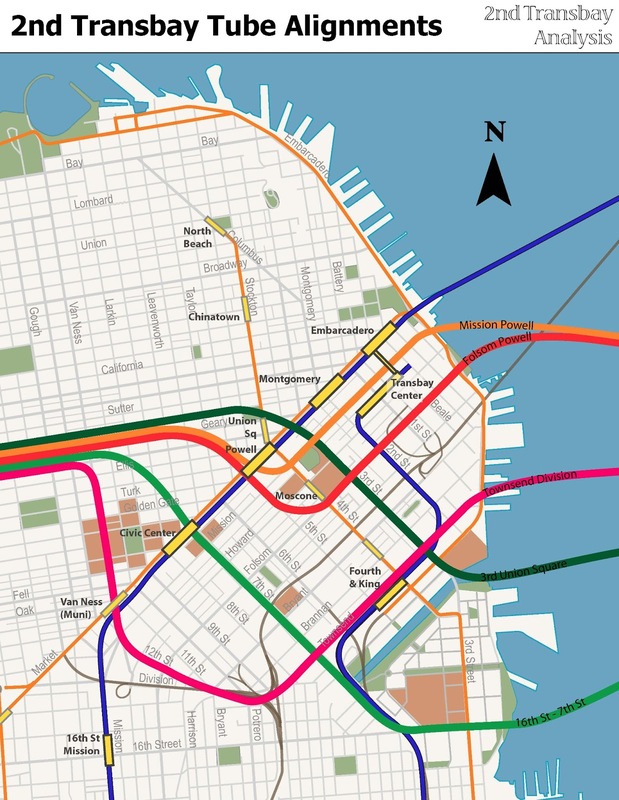 So where should a Second Transbay Tube go once it arrives in San Francisco? The general dialogue, from both BART (with option 1 and option 2) and SPUR, has focused on bringing it into the South of Market neighborhood. Other dialogue has focused more on connection to the Transbay Terminal, which is important, but not specifically what we're discussing in this post. But where exactly should it go? Many different needs and potential opportunities arise with aligning a new rail line. I've created a poll to get feedback from you the readers, to see where you think a new BART line should go. Note the Poll is NOW CLOSED. To see the results, read my post, "Evenly Split..."
Please cast your votes on the ballot in the column to the right, near the top of the web page. Note that the poll can only be accessed from a computer or by the full web page on a mobile device. It's not accessible through the mobile version of the web site. Please make your voice heard in comments. Also, please excuse the misspelling of the word "further". I've tried to edit the word, but Blogger won't let me even edit the question since people have begun to vote in the poll. If you're a fan of the 3rd Street Union Sq alignment, please say so in comments. 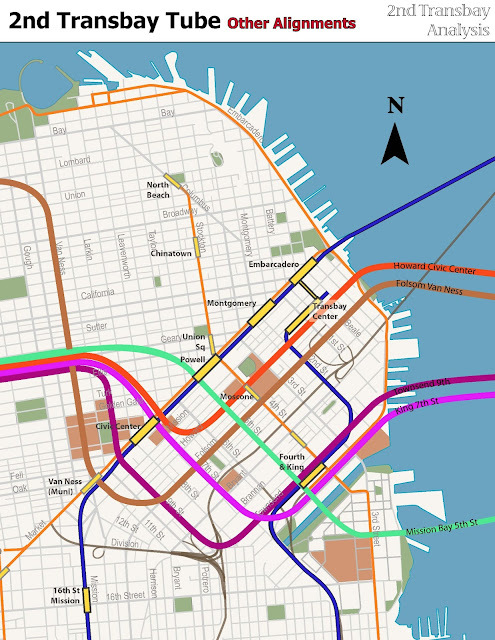 The map below shows the basic alignments: Essentially from San Francisco Bay (south of the existing Transbay Tube) and eventually through to Geary Street at Van Ness. I've added a second map showing other alignments mentioned in comments or on Twitter, plus the Folsom Van Ness alignment presented by BART several years ago. You can see them in the same map form at the end of the post, after the break. Of course there are really dozens of alignments that could be considered. However, here you have five basic ones that pass through or by SoMa, and connect with existing BART, or Muni Metro, or Caltrain or some combination of the three. I make no specific designations of where stations should be located, or whether BART should have a standard gauge track or the special BART gauge track on the existing BART system. All of these routes could also have a separate set of tracks connect to the Transbay Transit Center and the Caltrain Downtown Extension. Help alleviate the demand on the existing BART Market Street route, especially at Embarcadero and Montgomery St stations. Create sufficient line redundancy so that in the event of one line going out (e.g. accident, maintenance, earthquake), the other line would function to cover for both lines. I'm sure there are other elements to consider but those are the primary ones that come to mind. Feel free to add your own important considerations in the comments section. An upcoming piece will examine how we must plan for a second tube and the Caltrain Downtown Extension (DTX) in concert so that we have the best regional rail and local rail system serving Downtown San Francisco and other neighborhoods of the city. For now this poll will look primarily at how a new BART line could access SoMa and/or Mission Bay and on to Geary Street. Below is a map showing other alignments not previously mentioned. They came up via comments. Below is a list of the lines. These are not included in the poll so your head wouldn't turn to mush from 10 choices. In much of Soma, you are only a few blocks from a Bart station, anyway. At a guess I'd favor the 16th-7th route, because it is the furthest from simply following the existing line (crossing it perpendicularly), and opens up the most "potential"
Most of them - too many curves. Witness the Oakland Wye. Agreed that the Oakland Wye is a mess. The problem isn't curves themselves, but their tight turning radii. Tight turns in areas far from stations are a very bad. Moderate to gentle curves are ok, and even moderate ones near stations are ok since the train has to slow down anyway. Witness the gentle curve from Market to Mission on the existing system, or even Oakland's slightly less gentle Paramount Theatre curve at the northern end of Broadway (just north of 19th St Station). The Paramount curve requires trains to slow down a bit, but not enough that its a problem. These are both functional and efficient curves. So if you build curves that are very gentle or moderate, it all still works. There are 3 moderate to tight curves shown on the map. In my opinion, the Van Ness-Geary curve on the Townsend line is a deal breaker. If you want a station near Van Ness and Geary, the turn has to be too tight. If you want a more gentle curve there, the station is too far away from the Geary/Van Ness intersection. I included this alignment since BART proposed it a few years ago. The Market/Powell curves on the Mission Powell and Folsom Powell lines are moderate. If the tunnel is deep enough, it could probably make a very gentle curve, but a Leavenworth/Geary station might be eliminated from possibility then. I forgot to mention, on the Mission or Folsom alignments, you could take the line to Civic Center instead of Powell. This would work best on Folsom. However moving the curve from SoMa to the TL further west would make for a tighter curve from the TL to Geary. The question is, how tight? The tight curve problem at VN/Geary on the Townsend/Division route could easily be solved by not going up Van Ness! You don't actually need run under Van Ness. The line could head up 9th or 10th from Division and then continue up Polk or Hyde and then make a gentle curve to Geary/Van Ness for a station there (running east-west). This would still have a direct interconnection at Market to the Van Ness Muni Metro station and could even have a relatively simple interconnect to the Civic Center BART station. I just added a map showing a Townsend-9th St-Larkin alignment connecting to Geary. Check it out. Where did the North Beach Central Subway station come from? Let's just say the Central Subway tunnel is being bored up to North Beach, and that hopefully by the time a 2nd Transbay Tube is built, there'll be a North Beach Station. I should have included the E-Embarcadero line through the Fort Mason Tunnel to Fort Mason at Marina and Laguna. I'll update the map. That's true, it'll be 30 years before a 2nd tunnel and probably about the same before a station comes to North Beach. On that same note, won't the CS tunnel impede the 3rd/Union Square route? Unless they go really shallow above the existing lines. Going under the CS tunnel would put the BART tunnel 100+' under. The only two that make sense are the Townsend/Division and 16th/7th alignments. The other ones don't meet the basic criteria of serving new underserved areas of high growth. All of the area of east soma and transbay are adequately served by the existing market street BART/Muni corridor and the new Central Subway, which connects to Powell (which has lots of capacity still). The capacity issues at Embarcadero can be relatively cheaply dealt with by adding more vertical circulation, deploying three car trains, etc. Saddlebags are unnecessary and ridiculously expensive for a project that does not expand transit service. All the growth is in Mission Bay, Pier 70, Townsend/Showplace Square. That's the area that needs BART service and is too auto-oriented. Investing more in the Market/Mission corridor would be shooting ourselves in the foot and failing to see the obvious -- the next (and current!) generation of major growth - we're talking tens of thousands of jobs and residents, are all way far from Market and Mission Streets. 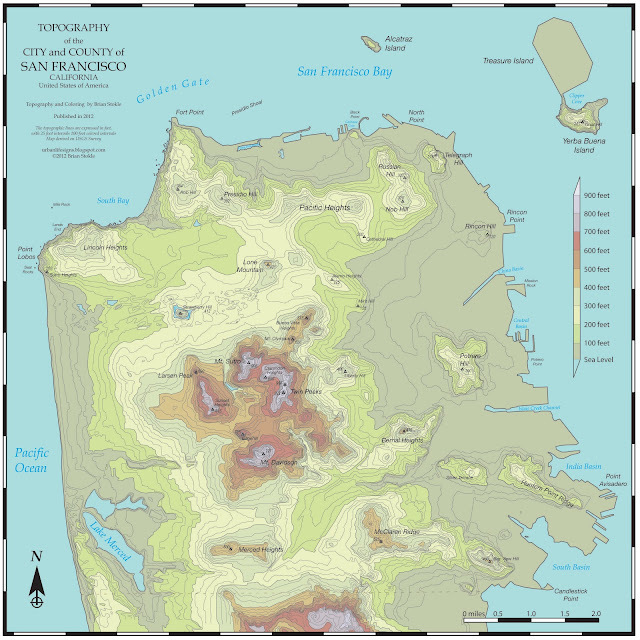 Transbay is a drop in the bucket. Good intermodal connection can happen at 4th/King to connect to Caltrain and Muni Metro (T+E+N lines). I think the Townsend/King alignment does the best at serving a high growth area not well served currently. However, I think a key objective of any new tube is that it also carry standard gage track in addition to BART gage track. This allows not just intermodal connections, but actual through routes from the peninsula to east bay. In order for that to happen, either Transbay or Caltrain 4th & King needs to have run-through tracks that connect Caltrain to the tube. BART tracks and standard tracks could diverge after the tube, therefore that objective does not need to control the BART alignment, but it should be a strong consideration. Of course we could accomplish much of this objective by adding tracks back to the bay bridge. BART should not be the only peninsula - east bay transit connection. I agree with you regarding the standard gauge issue. 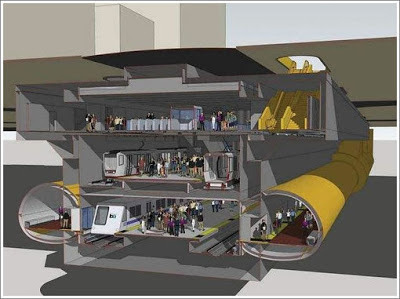 At least in San Francisco, if a Second Transbay Tube (2TT) is only 2 tracks(2TT-2b), a new separate BART line must be standard gauge, and a tunnel split to the Transbay Center is nessary. The question then would be, how would a new standard gauge BART line in the East Bay best serve the East Bay and its access to San Francisco and the Peninsula? 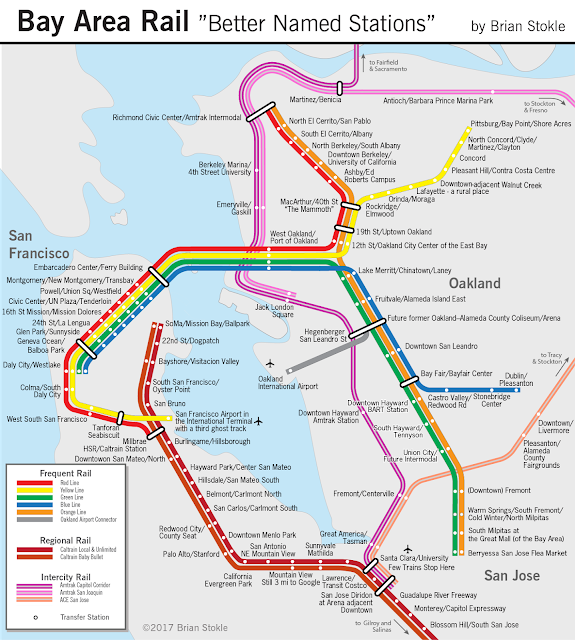 Should the "new BART" line follow existing rail alignments (e.g. UP from Oakland to Richmond and on to Hercules), or should a new line go to denser underserved areas along the MacArthur Blvd corridor to Grand Lake, Dimond and Eastmont? That's the tougher question. I like the Townsend line, but I would prefer it to change to 7th Street rather than Division. As much as I like the idea of there being a BART station at Van Ness, that line would not connect to any of the current BART lines for transfers, whereas having the new line go through Civic Center would allow for that. A stop near Caltrain/Mission Bay/the ballpark would be convenient both for commuters as well as people attending games. Not to mention, with the new Warriors arena going in, it would split the traffic heading to the East Bay, which is good because Embarcadero will get crazy after a game. You're right that the Townsend line could turn at 7th Street. I actually think that probably makes more sense than a Division/Van Ness turn due to the challenges of the turn west at Geary, and as you mention, you get a Civic Center BART system transfer in addition to Muni Metro. The MASSIVE investment requires careful planning to make sure we get absolutely every cent of value back on this project. What areas are underserved? Where is the city growing? How can we enhance connections to other transit modes? Combining all these with the design constraint of minimizing curves, the 16th-7th alignment seems to beat all. I just can't justify the redundancy of placing a multibillion, multidecade tube only blocks away from the only other one. The 16th-7th does the best job of building out service to an entirely new section of the city. A new transbay tube that doesn't take standard rail makes no sense. In fact there's no need for BART at all. It should be an extension of the HSR line across the east bay, which could also allow Caltrain to reach the East Bay, as well as allow Amtrak to reach San Francisco. That would be a true expansion of bay area rail. I'm all for extending BART (or any heavy rail) up Geary in a subway, but that's really a separate issue from a transbay tube. I would prefer a Howard/Powell alignment with a double decker tube. HSR/Caltrain would take up the other level. Your next question should be where this tube goes to outside of DT San Francisco. How much would a second transbay tube cost, and is building a second transbay tube the most cost-effective way of increasing accessibility? Any 2nd tube should also include standard gauge tracks for HSR (doubling the cost?). Given this constraint, and if you want to allow trains to pass straight through the TT, rather than operate it as a spur - then you've got options of mission/howard/folsom. I go with folsom because further from market it'll have less redundancy with existing lines on market.